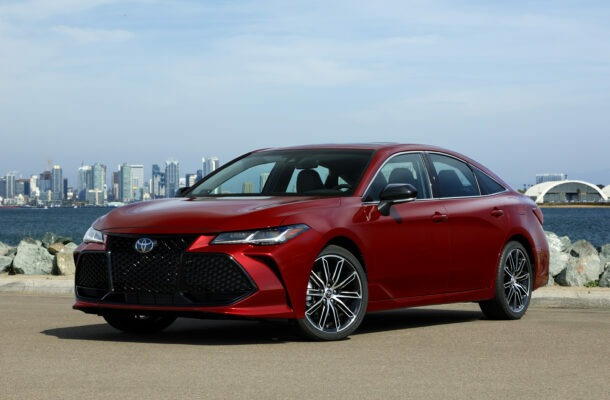 The 2019 Toyota Avalon full-size sedan has been redesigned, and it wears a more sleek body that’s longer and lower. To go with this show, the go from the V-6 engine gets an increase in horsepower to 301. It’s mated to an 8-speed automatic transmission and front-wheel drive. The Avalon Hybrid returns, remaining one of the few dedicated full-size hybrid sedans on the market. It pairs a 4-cylinder engine making 176 horsepower with electric motors and batteries to make a total of 215 horsepower. That’s less than the V-6, but the Hybrid gets 43 city and highway miles per gallon, much more than the V-6. There’s even a sporty XSE Hybrid model. The V-6 is EPA-rated at 22 mpg city, 32 highway, 26 combined; models with the most equipment and larger wheels post slightly lower figures. Safety-wise, the IIHS gives the 2019 Avalon its Top Safety Pick+ rating, with “Good” scores in every crash test except small-overlap, where it’s rated “Acceptable.” The NHTSA gives it five stars overall, though in subtests it posts mostly four-star scores. Standard safety equipment on every 2019 Toyota Avalon includes forward-collision warning with automatic emergency braking, active lane control, blind-spot monitors, adaptive cruise control, a rearview camera, and emergency assistance (with a three-year trial subscription included) that can notify first responders in a crash, track a stolen Avalon, or call for help to fix a stranded car. Standard equipment on every 2019 Toyota Avalon includes synthetic leather upholstery, LED headlights and taillights, 17-inch wheels, a 9.0-inch touchscreen with Apple CarPlay compatibility, Bluetooth, and five USB ports. For $36,395, the Avalon XLE also gets a moonroof. The Limited for $42,695 ($43,695 for the Hybrid Limited) gets real wood trim, 18-inch wheels, JBL premium audio, heated and cooled front seats, heated rear seats, leather upholstery, and less aggressive bodywork. The Avalon Touring for $43,095 includes synthetic leather upholstery with suede inserts, navigation, heated steering wheel, a head-up display, 19-inch wheels, adaptive dampers, and sport exhaust. The boldness and daring angles of the 2019 Avalon are new, and they’re dramatic compared to previous versions. The busy grille is big and wide, and in the sport trims (XSE, Touring) it’s textured in mesh that’s split into sections. The LED headlamps on the Touring model are laser beams that shine like disco balls. The sides and rear look more lean and spare. The spoiler on the trunk lid gives a sporty flair, and the LED taillamps offer a glimpse of Lexus at the rear. The cabin tones it down with a look that’s sharp and cohesive, even with contrasting colors. It’s plush, calm, cozy, and more luxurious than the price suggests. The materials are gorgeous, especially the elegantly grained real wood trim from Yamaha–and that’s Yamaha the musical instrument-maker, not Yamaha the motorcycle-maker. The Avalon offers synthetic leather upholstery, real leather that’s quilted and perforated, or synthetic suede. The big 9.0-inch touchscreen floats over the dash, while being canted toward the driver and flanked by redundant buttons for menu, navigation, map, and others. The front seats are supportive and comfortable for long periods behind the wheel, while in the rear there is a ton of legroom–40 inches, enough for one of our editors who is 6-foot-3. Shoulder room and hip room are just as good. Air vents, two USB ports, and available heated seats in the rear make it exceptional for passengers. The trunk holds a hungry 16 cubic feet, and is wide enough for golf bags. It’s the same in the Hybrid for 2019, as the battery pack has been moved to under the rear seat. From a performance standpoint, the redesigned 2019 Toyota Avalon puts out more horsepower, but it’s still laser-focused on relaxed cruising. The wheelbase is two inches longer, which smooths out the ride even more; it’s still front-wheel drive, while some sportier rivals are rear-wheel or even all-wheel drive. The 3.5-liter V-6 makes 301 horsepower and is mated to an 8-speed automatic. It’s strong, athletic, and confident when passing. With MacPherson struts in front and links in rear, the suspension provides a supple ride and does a good job over the bumps. The XSE and Limited use stiffer springs and heavier stabilizer bars for better cornering, while the Touring gets the Avalon’s first adaptive damping suspension system (it’s optional on the XSE). The system varies damping and shock stiffness in Normal and Sport+ modes. Normal is smooth, while Sport+ changes the car’s handling dramatically, with heavier steering, quicker throttle response, gear changes at higher revs, and a stiffer ride. We would say the Avalon’s hidden talent is its retuned electric power steering rack that’s comfortably heavy and engaging. There’s not much feedback, common with electric power steering, but the feel is surprisingly good. The Hybrid is quiet, composed and handles like the XSE. The new battery pack only adds about 100 pounds to the curb weight. The Hybrid uses a continuously variable automatic transmission (CVT) that keeps the big sedan in its efficiency sweet spot, but doesn’t offer the driving enjoyment of the 8-speed. The 2019 Toyota Avalon ticks almost every full-size sedan box. It’s longer, lower and sharper, the cabin is beautiful, there’s vast room in the rear seat, the ride is supple, and the powertrain is polished, with a powerful V-6 and smooth 8-speed automatic. The Hybrid is slower, but you can’t argue with 43 miles per gallon.